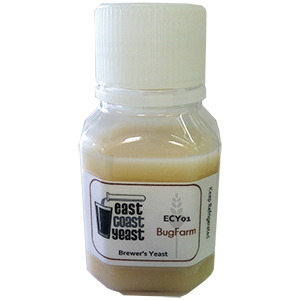 East Coast Yeast BugFarm is a highly sought after yeast blend. Over time displays a citrus sourness and barnyard funk profile. Large complex blend of cultures to emulate sour or wild beers such as lambic-style ales. Over time displays a citrus sourness and barnyard funk profile. Contains yeast (Saccharomyces, Brettanomyces) and lactic-acid producing bacteria (Lactobacillus, Pediococcus). The Brett population is > 50% of the culture. The BugFarm blend changes strains every calendar year for those who like to blend aged brews. The 2014 version contains a wild Saccharomyces yeast and four different brett isolates, L. brevis and Pediococcus.